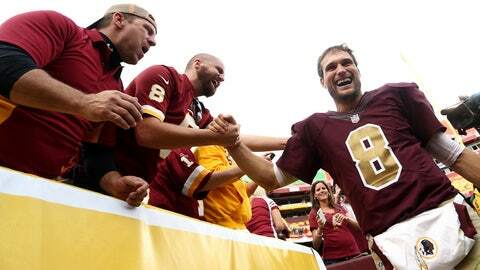 Redskins quarterback Kirk Cousins enjoyed arguably the best game of his career in Week 7. Washington Redskins quarterback Kirk Cousins led the team to the biggest comeback win in franchise history in Week 7, and he was rewarded by being named the NFC's offensive player of the week. Cousins completed 33 of 40 passes for 317 yards and three touchdowns with no interceptions. He also did his best RG3 impression when he ran a read-option play into the end zone for an 8-yard touchdown run in the Redskins' 31-30 win. The Redskins trailed 24-0 before Cousins led the team to 21 unanswered points. He would later find tight end Jordan Reed for a game-winning touchdown pass with 24 seconds remaining to cap off an 80-yard drive.